- They hope to be showing One:12 Ghostbusters at SDCC (at 55-56 minutes in the video)... and said that they would love to do a One:12 Ecto-1 with lights and sounds in the future. - They will have their first One:12 female figure on display at SDCC. (at 54 minutes in the video) He didn't say which one, but BvS : DoJ Wonder Woman please?! Or a Carrie Kelley Robin?! I can't wait to find out! Last edited by englishw; 05-27-2016 at 05:13 PM..
Yeess, our prayers have been answered, brother ! Huh... I thought this would be front-page news. I guess without pictures it isn't as entertaining? SDCC will be here soon enough. 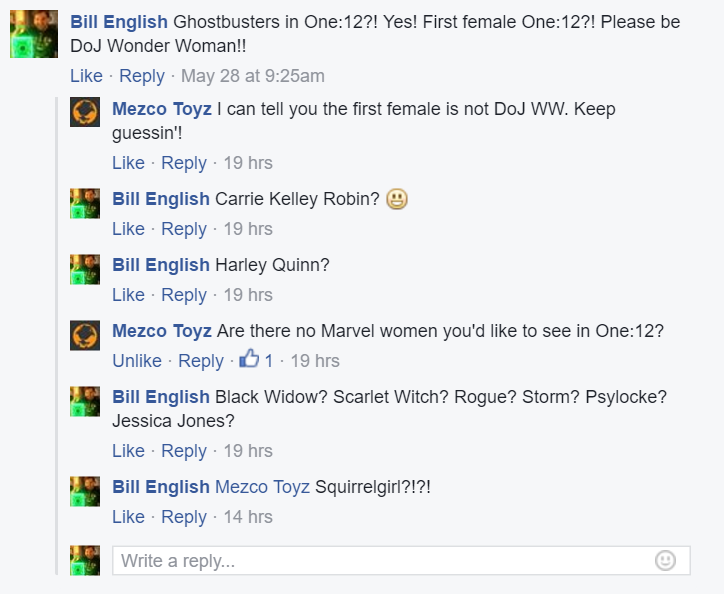 First One:12 female figure (on display at SDCC 2016) will NOT be DoJ Wonder Woman. Sounds like she will be from the Marvel universe! What's your top Marvel female pic for Mezco to add to their One:12 Collective? My guess would be Black Widow or Elektra. What female character would benefit most from the ability of this line to conceal ugly articulation behind fabric? It seems reasonable to rule out characters that tend to show a lot of bare skin (Elektra). On the other hand, those same characters are sometimes known to wear suits of armor or other outfits under special circumstances. The extra articulation seems to necessitate a beefy, heavyset look. Which female characters are best suited? She-Hulk, in some kind of unitard? I was sorely tempted to jump aboard when this line first came out, particularly with Dark Knight Batman, but I've cooled a lot since then. I'm inclined to wait for a deal in the secondary market if a particular character stands out. This line's got my attention now! Can't wait to see which Marvel lady makes it into the line.